Voting in Arizona’s Primary & General elections is vital to ensure we elect candidates that put business first. In 2014, of the 3.3 million registered voters in Arizona, only 47 percent cast votes on Election Day, making it the lowest level of voter turnout since 1998. However, presidential election years see a higher voter turnout and since Arizona is considered a battleground state this year, election officials are expecting to see more people at the polls. Voter registrations have already increased by nearly 100,000. This year, Arizona voters will elect one U.S. senator, nine representatives to the U.S. House and fill our state Capitol with 30 senators and 60 representatives. The Greater Phoenix Chamber of Commerce invites you to view our list of 50 candidates for the Arizona Legislature which have earned our endorsement for the August 30 Primary Election. In the General Election on Nov. 8, Arizona voters will also cast votes for or against ballot initiates. There are two ballot initiatives – upon which the Chamber recommends a NO vote – that will have negative impact on the business community. Those are the Regulation & Taxation of Marijuana Act and the Fair Wages and Healthy Families Act. Early voting remains highly popular among Arizonans, with early ballots accounting for approximately 90 percent of votes cast. To receive an early ballot, voters may place themselves on the Permanent Early Voter List (PEVL). Using this option enables voters to automatically receive an early ballot for each election without needing to individually request one each time. Registering to vote and/or adding your name to the PEVL is a simple process. Other voter registration options include physically mailing in a completed registration form found through the website link above or filling out a registration form in person at a county recorder’s office. The Chamber makes sure the voice of the business community is heard loud and clear at all levels of government. 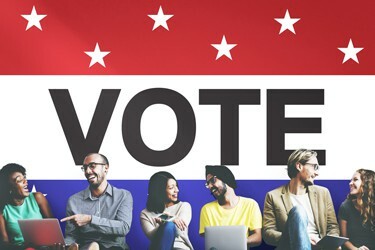 Voting in the Aug. 30 Primary Election and Nov. 8 General Election is vital to ensure that government is populated by candidates that put business first.